David Leavitt is the co-director of the creative writing program at the University of Florida, a Guggenheim and NEA fellow, a Yale graduate, and the author of over a dozen highly regarded fiction books. His short-story collection Family Dancing was a finalist for the PEN/Faulkner Prize and the National Book Critics’ Circle Award, and his novel While England Sleeps was a finalist for the Los Angeles Times fiction prize. His writing has also appeared in periodicals such as The New Yorker, Harper’s, The New York Times, The Washington Post, Esquire, Vogue, and The Paris Review. When not teaching or writing, David Leavitt edits Subtropics, the new and already well-respected literary magazine put out by the University of Florida that has published such authors as Allan Gurganus, Steve Almond, Manil Suri, and fellow UF professor and novelist Padgett Powell. Since your novel is based on history, I’m wondering what aspect of the story hooked you to the point that you decided to write a book about it. Was your attraction more to the unpolished genius of Ramanujan, the mathematics, the WWI-era Cambridge academic environment, the complex interpersonal relationships, or another theme you wished to explore? All of these aspects of the story interested me. Ramanujan’s experience connected him to many different facets of twentieth century experience–Cambridge, Bloomsbury, World War One, the evolution of homosexual identity, the collapse of Empire–and this was what made the story, for me, so irresistible. In many ways I felt that the story chose me and not the other way around. Given that you share a similar profession and sexual identity as Hardy (the professor who works with Ramanujan at Cambridge), how much of your own personality do you feel you infused into your portrayal of him? He’s actually very different from me–much more controlled, measured, acerbic, precise, arch. A cat lover, whereas I am a dog lover. An authority on games of all sorts, whereas I am something of a clunkhead at games. (An elementary school teacher noted of me on my first grade report card: “Although David isn’t as co-ordinated as the other children, he certainly does seem to enjoy himself.”) The character with whom I felt the stronger sense of identification, curiously enough, was Ramanujan. As the professor of a subject much different from mathematics, do you feel you could have anything close to an equivalent experience to Hardy’s relationship with Ramanujan? Intermittently, I’ve had students in whom I’ve detected a spark of genius and whom I’ve tried to help along as Hardy helped Ramanujan. Writing fiction, though, is a very different business, and the University of Florida in 2008 is a very different place from Cambridge in 1912. Fortunately, no student has ever died on my watch, though we did have an attempted murder a few years back. In what ways, if any, did researching and writing this book cause you to rethink your interpretation of the world? Did writing it change the way you live your life in any significant way? I suppose that writing the book broadened or globalized my perspective and compelled me to look hard at the ways in which private experience is impinged upon, sometimes fatally, by what appear to be abstract and remote historical events. War in particular. The book also opened up in me an immense curiosity about the past. Amazingly enough, when I was an undergraduate at Yale, I didn’t take a single history course. Now I’m trying to make up for what seems, in retrospect, to have been a missed opportunity. Which are you more passionate about: food or religion? Food. No question. Although, as I learned while writing The Indian Clerk, the two can become highly entangled. Pierre Bayard’s How to Talk About Books You Haven’t Read. Which non-literary profession would you find most compelling to pursue? Interior design. Unfortunately, I am ham-handed with color. Not one that I instigated. What are your feelings about the literary scene in Gainesville? Has it improved or declined since you have lived there? As literary places in the world go, literary Gainesville has an off-kilter liveliness that I find very appealing. Teaching in our writing program we have, on the fiction side, Padgett Powell (who was born here), Jill Ciment, Mary Robison (whose forthcoming novel, One D.O.A., One on the Way, is, by the way, a masterpiece), and me. 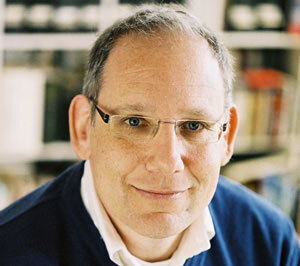 On the poetry side, we have Debora Greger, Sidney Wade, William Logan (“the most hated man in American poetry”–a moniker he wears with pride), and Michael Hofmann, who is rapidly distinguishing himself as one of the foremost literary translators from German into English working today. We are an eclectic and diverse bunch. The literary scene here has been much enlivened by the addition of Mary and Jill to our ranks. The Festival this year will feature John Barth, Eileen Pollack, Craig Raine, and C. K. Williams. It seems as though UF didn’t have much of a presence in the world of lit mags before you launched Subtropics. Talk about the genesis of the magazine and the philosophy that guides you as its editor. We never had a literary magazine before Subtropics. Starting one was something I wanted to do from the day I arrived (and I’ve been here since 2000). Persistent campaigning on behalf of the idea of a literary magazine to the English department and to various deans eventually led to our being awarded some Gatorade money–yes, this really is the money that the university earns from Gatorade royalties–in 2005. Our first issue came out in 2006.
consider, quite simply, to be high quality, which is why you’ll find, in Subtropics, a great diversity of voices and approaches; stories that are formally experimental (Chris Bachelder, Marshall Klimasewiski, Allan Gurganus) as well as stories that are fairly traditional (Nancy Reisman, Katie Williams, Frances Hwang); stories that concern themselves with the contemporary (Roy Kesey) and stories that dig into the past (Ben Stroud). To put it simply, I’m trying to make the kind of magazine that I would feel compelled to buy were I browsing at literary magazines in a bookstore. 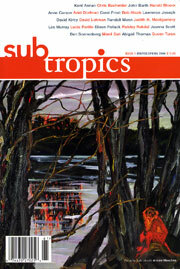 What stories are you most proud to have published in Subtropics? Eileen Pollack’s “The Bris” has earned Eileen (and us) some well-deserved praise. It’s a bold and audacious story and it made our first issue a winner. I’m very proud as well to have published two superb excerpts from John Barth’s forthcoming The Development. I love Allan Gurganus’s story “‘We, of Weedland'” from issue 2, and Matt Freidson’s “The Story of Joe from New Jersey” in issue 3, and Roy Kesey’s “Stump” in the new issue. Most of these stories came through agents or friends. Of the stories that came from the slush pile, the one I’m proudest to have published is Kuzhali Manickavel’s “The Dynamics of Windows” in issue 4. Sidney Wade is in charge of the poetry. I can claim no credit for the excellent (and widely varied) poems that she has found for the magazine. I can say that I love a lot of this poetry, in particular the work we’ve published by Anne Carson, Ben Sonnenberg, and Matthea Harvey. Finally, I’m very proud that we’ve published as much work in translation as we have (we try to include at least two works in translations in each issue) and that we’ve managed to rescue some very good stuff that was on the brink of disappearing into out-of-print obscurity: among other things, poems by the former Florida Poet Laureate Vivian Laramore Rader and a killer story by the British writer Isobel English. Beyond the UF campus, where am I most likely to run into you the next time I’m in Gainesville? The 2nd Street Bakery. This is where I meet students, write, grade papers, chat with friends, and drink large quantities of extremely good, organic, shade-grown coffee. Posted in Author Interviews and tagged 12 Questions, David Leavitt, Florida Writers, Matt Borondy, Subtropics, The Indian Clerk, University of Florida. Bookmark the permalink. Trackbacks are closed, but you can post a comment.